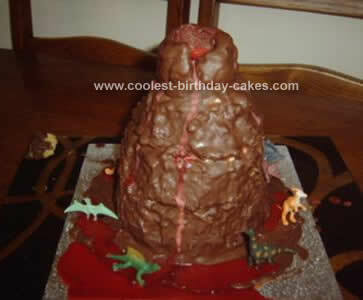 This Volcano Birthday Cake was my 2nd attempt at cake making. A volcano cake for my son’s 6th birthday. I made this pretty much the same as the Dalek I made. I used 3 8″ cakes and a smaller domed cake baked in an oven proof dish. I roughly shaped the cakes to represent a volcano cutting a hole into the top of the domed cake. This time I had coloured the cake mix 2 different colours for the different colour in rock! I also used jam and fresh cream between the layers. I covered in a cracking chocolate sauce and put red icing in the top of the cake and down the sides and around the bottom then dotted some dinos around the bottom .